Tests during 2002 at the Wulf Test Field demonstrate that the AirX fails to meet the manufacturer's power curve by a wide margin. Key words: AirX, Air 403, Southwest Windpower, Small wind turbine testing. Disclosure: The three versions of the AirX tested as well as a Whisper H40 were provided by Southwest Windpower at no charge in lieu of noise measurement services provided by Paul Gipe. During these tests I noted that the AirX was not meeting its power curve. Previous measurements of the Air 303h and 403 indicated that these turbines also failed to meet their advertised power curves. However, the AirX failed by a much wider margin. In cooperation with Southwest Windpower I've tested three versions. These I call AirX.1, AirX.2, and AirX.3 respectively for lack of a better description. For the most part the difference between the versions is programming on the chip that controls the AirX's operation. 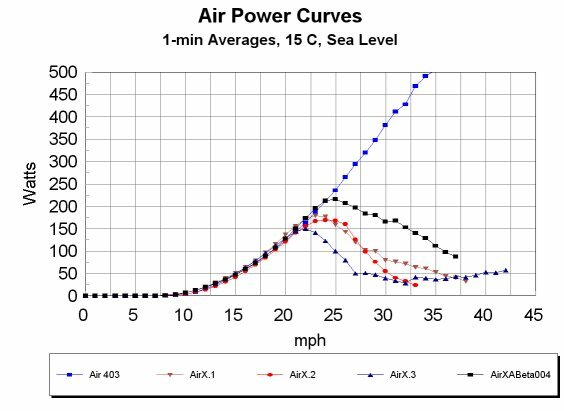 None of the AirXs tested met or even approached the power curves in Southwest Windpower's owner's manual. Power was measured with a watt transducer and average during 1-minute periods. Wind speed was recorded on the tower with the turbine. The turbine was tested at an elevation of 4700 feet (1430 meters) in the Tehachapi Pass. Data was corrected to sea level, 15 C conditions. For more details on the test technique, altitude and temperature correction, averaging period, and possible losses in the conductors see Testing the Power Curves of Small Wind Turbines. While the performance of the three versions differed, sometimes markedly, from one another, the overall performance fell far below that of the Air 403 and that of the manufacturer's proffered power curves. Southwest Windpower clearly, and fairly state on page 28 of the AirX Owner's manual that the manufacturer's power curve represents "instantaneous wind speed". This is a significant improvement over previous power curves for the Air 303 and 403 that were not so identified. Nevertheless, purchasers will expect that the turbine produces the advertised power on a consistent basis, which it does not. The AirX will briefly reach rated power but begin to regulate. When it does so, the average power produced is well below rated. For example, if the AirX reaches rated power and begins to regulate, the turbine may be braked for as much as half a minute. When it does so the average power is half that of rated, or 200 W. Actual performance is even less that this. The AirX compares well with the Air 403 and meets the more conservative of the company's two power curves up to 23 mph (10 m/s). At rated wind speed the AirX delivers only 103 W 99 W, and 51 W respectively, not the 400-525 W advertised. In the worst case, the AirX.3, the turbine only produces 10% of the advertised instantaneous power claimed. This is probably a record of some sort. The AirX.ABeta004, a preproduction version tested during December 2003, performs better than previous versions of the AirX. This version meets the manufacturer's power curve up to about 24 mph where the controller begins to regulate the turbine. As Michael Klemen points out, this isn't the whole story. Energy production is reduced by a lower than expected power curve, but the energy generation lost is not quite so dramatic. In a 12 mph (5.4 m/s) wind regime with a Rayleigh distribution, the AirX.2 and AirX.3 will generate 80% of the 388 kWh/yr produced by an Air 403. 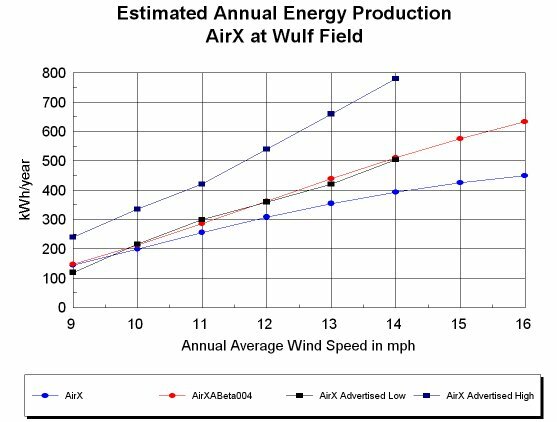 In a 14 mph (6.3 m/s) wind regime with a Rayleigh distribution the AirX.2 and AirX.3 will generate 65% of the 612 kWh/yr produced by an Air 403. The AirXABeta004 delivers the low range of the annual energy output projected by the manufacturer, but falls well below the upper range proffered by the manufacturer. At an average wind speed of 12 mph, this version produces about 360 kWh/yr, only two-thirds as much as the manufacturer's advertised high range. The AirX is both subjectively and quantitatively quieter than the Air 303 and Air 403. However, this is accomplished at a significant sacrifice of performance.